We’ve been to Jim Hogg Park a number of times, in fact, it’s where we tore the roof of our RV open on a low hanging tree branch a couple years ago, and I believe that was the last time we went. Jim Hogg Park is on Lake Georgetown, and is a Army COE park. It is part of a cluster of COE parks around the lake, including Cedar Breaks Park, which is where we launched the boat for the first two outings. 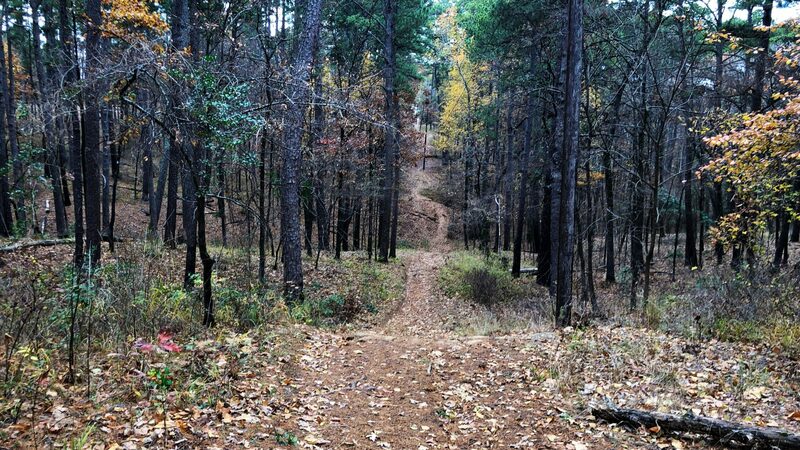 Jim Hogg Park has more camping accommodations, including some double sites, one of which (Site S008) we booked one for a long 07/04 holiday weekend. The double sites with screen shelters run $40/night. 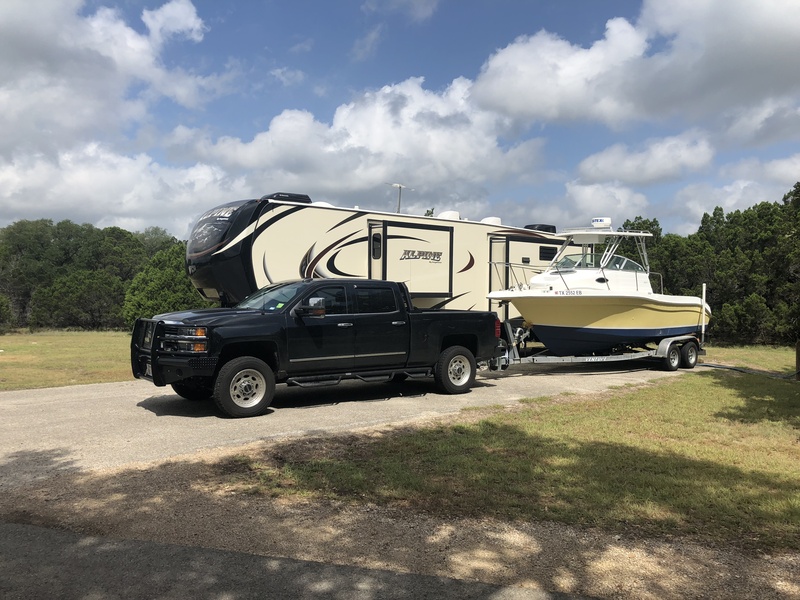 It has a nice cabin on the door side of the RV that is screened in with a ceiling fan and light, and generous parking pad that is large enough to fit our truck and RV on at least twice. The boat ramp is decent (three lanes, if I remember correctly) but the docks are almost entirely out of the water right now, with only one partially submerged and barely enough to be usable. It’s the furthest dock from the ramp, and a decently long walk between them. We launched the boat and twice on our trip, and probably spent 8-10 hours total on the water with Maggie and Violet (Max is too old to sit in a hot boat and doesn’t like getting in the water, so he stayed in the A/C in the RV). We spent quite a bit of time anchored in a little cove we found playing fetch with the dogs. Violet loves jumping off the boat and fetching things, with a huge boost in confidence provided by her life jacket. Maggie, the one who typically loves water, is afraid to jump off the boat or get back in, so she supervises. I don’t have a photo on my phone of either of them in the water, but here is one of Kelly in the water and Violet giving her a toy to throw. 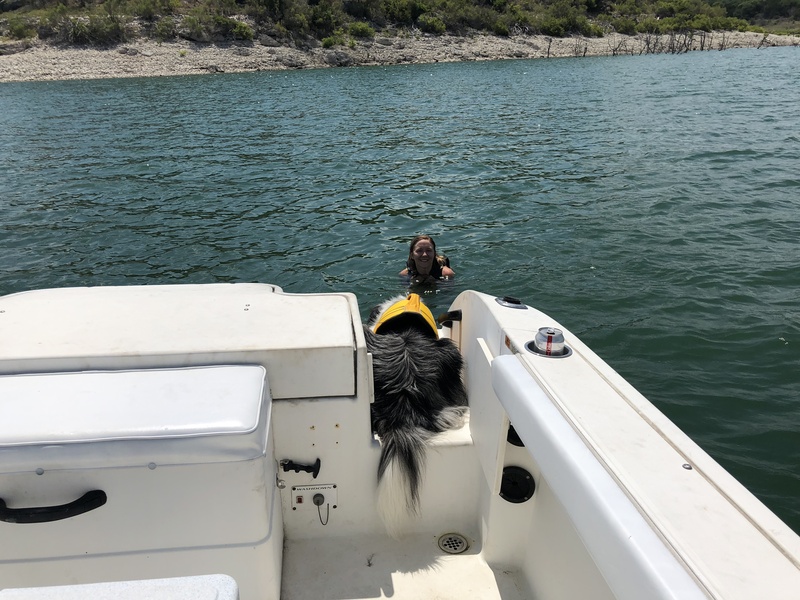 Because Maggie is so afraid of diving in the water and getting back in the boat, but loves being in the water, and because we got so scratched up getting Violet in and out, we spent quite a bit of time over the weekend looking for a better way. There are a handful of products on the market – ladder attachments that act as stairs, attachments that act as platforms, DIY attempts that are either bulky and difficult to store or don’t look inherently stable enough to really consider (or both), and ultimately we decided on one of the more popular commercial solutions. The one semi-viable DIY solution I considered at length is heavy rubber matting supported by pool noodles, but ultimately storage and stability, like most other DIY solutions, caused me to eliminate it. The one we ended up ordering is unfortunately expensive, but in-line with most of the other premium solutions, at about $400. As I’ve found with most things (B)reak (O)ut (A)nother (T)housand related, it seems like a lot of money for what it is, and I still have a little bit of sticker shock. It’s a free-floating ramp that you tie to the boat and doesn’t depend on the boat for stability, gives them a place to rest without actually having to get into the boat, and is compact enough to store without getting in the way when not in use. We can use the the same pump that we have for airing up the inflatable rafts and tubes to air it up, so doesn’t require any additional pumps to be stored on the boat. I also purchased two dock cleats to mount on the platform opposite the boat ladder, and some 3/8″ double-braided marine rope, to attach it with. Regarding the boat itself, the outdrive has a couple issues I need to address, most notably a whine which I believe to be a shimming/ backlash issue, and some possible water intrusion – there was some foaming of the oil when I checked the dipstick on Saturday morning, but not enough to worry me, at least at that time. I bought a gauge and a .004 shim to try and fix the whine, but without measuring, the shim I ordered was just a guess. I swapped out the stainless 15×15 prop for a cheap aluminum 14.5×17 last Thursday, which the boat seems to like better. During the sales that were going on for Independence Day, I grabbed a new pair of Tempress Elite seats, Springfield Camlock Slides, and folding cupholders to put in the above photo where old ones were mounted on either side of the engine box. I used vinyl spray paint – which you can see in the photo – to refresh the vinyl upholstery in the boat and avoid spending $1000 for now on labor and material. For $50, I’m thoroughly impressed in how easy it was to apply and how well it seems to be holding up to water, sunscreen, cleaners, and friction incurred during use.